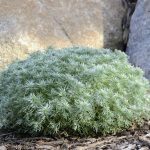 My Silver Mound Artemisia was flourishing, but now the leaves around the outer edges are dying, although some new growth is evident even in the dying sections. What is happening? Could grubs cause such a condition? Should I remove the dead and dying areas? Obviously, I'm no gardener, but I do really love this plant.